The Severn is the longest naturally navigable river in England; it was always navigable from Shrewsbury to the estuary, and during the seventeenth century it was made navigable as far as Pool Quay, near Welshpool. The River Avon was made navigable in the 1530's as far as Evesham, and eventually to Stratford. The River Wye, although not a tributary of the Severn, enters the estuary, and so is an integral part of the river system. It was important throughout the Middle Ages, but from the 1690's quite large boats went up the river as far as Hereford. There were also some failed attempts at improving navigation, on the River Stour, for instance. In the early 1660's there was a scheme, masterminded by Andrew Gaveston, to make the Stour navigable from Stourbridge, on the edge of the Black Country coalfields, through Kidderminster to Bewdley. He had considerable success until he ran out of money; soon afterwards there was a flood which swept away all the locks, and he could not raise the money to repair the damage. Several schemes to improve the navigation of the River Salwarpe, so that salt might be brought from Droitwich to the Severn at Worcester, also failed. Despite these failures the Severn was a working navigation. There were great problems in the eighteenth and nineteenth centuries, with the river being either short of water or in flood. There were tales of boats being held up in Shropshire for three months waiting for there to be enough water in the river to take them down to Bristol. The evidence is that this did not happen in the sixteenth and seventeenth centuries; the river was naturally navigable from Shrewsbury to Bristol. In the seventeenth and eighteenth centuries the Severn was the second busiest river in Europe, surpassed only by the River Meuse. One of the errors made in talking about the river is to say that it was a free river, that is that those who used it did not have to pay any tolls. This we now know to be quite wrong. Throughout the seventeenth century and early eighteenth century the citizens of Worcester and Gloucester were successful in making those who used the river pay a toll for passing under their bridges, the argument being that the boats collided with the bridges and damaged them, so it was necessary for the boat people to pay for the repairs. The boat people resisted this strenuously, and fortunately there are ten cases in the Court of Exchequer in London, boat people versus the citizens of Worcester, over the payment of these tolls. The written evidence presented to the court by the boatmen provides an extremely valuable source of information about the working of the river, but much of the evidence is conflicting and has to be studied carefully. So there were tolls on the river; those passing upstream paid a penny, while those going downstream were asked to pay threepence per ton of goods carried, a substantial sum in those days. First, it was very much cheaper to move goods by water than by road, as the number of men needed for a Severn trow was very much smaller than the men needed to transport an equivalent quantity of goods overland. One example of comparative costs is a country mansion, Priors Park, about ten miles to the west of Bewdley, near Tenbury Wells. In the 1580's it was rebuilt of sandstone brought by barge from the Iron Gorge area to Bewdley, and from there taken on horseback Lead for the roof came from Bristol, upriver, and then by packhorse. The load from Bristol, eighty miles by river, cost ten shillings; it also cost ten shillings to transport it ten miles overland. There were similar figures for the sandstone. Working from this example, it cost four times as much to transport goods by land as it did by water. Secondly, water transport was often speedier, particularly with heavy or bulky items. Thirdly, although it was affected by floods in winter and drought in summer, it was a much more reliable system of transport than the roads, which were impassable to wheeled vehicles throughout the winter months, in areas where there was a heavy clay soil. In his 'Tour Through the Whole Isle of Britain' Daniel Defoe tells how in the early years of the eighteenth century, in late April or early May, their stage coach was besieged by people as it passed through Stratford. On enquiring the reason for the celebrations, he learned that it was the first time for many years that a coach had reached the town so early in the year. Similarly, a salt works near Northwich in Cheshire was producing salt in the early seventeenth century by evaporating brine that bubbled up from a spring. The brine was put into iron vats and evaporated, using coal. The coal was brought from North Wales by water to the coast, near where Runcorn and Widnes now stand, and was then taken overland about ten miles to Northwich. The accounts are so detailed that it is possible to tell how the coal was transported; throughout the summer months it went in by wagon; very little was brought in during the winter, and the little that was came on packhorse. Finally, if goods were of a fragile or friable nature they could moved with greater assurance by water. Goods like glassware, pottery and even coal are friable, for if a load of coal is loaded into the back of a cart it is reduced to dust after a journey of ten miles. Historians like John Charters and David Hay have shown that we must be careful not to condemn the seventeenth century and early eighteenth century road system out of hand because of stray remarks. They have shown that roads were very widely used for the carriage of cloth and other goods which were both light and valuable. They have also stressed the flexibility of the packhorse as an all weather system of transport. They have produced ample evidence of a network of carriers working from London to almost every part of England by 1700. Road improvements predate the Industrial Revolution; in Cheshire causeways were being built, and the building of toll roads began well before the Industrial Revolution. Two very important toll roads were constructed in this area before 1720; the road from Gloucester to the scarp of the Cotswolds, built before 1700, and the salt road linking Droitwich and Worcester, made in 1714. By 1730 places like Hereford and Ledbury had several toll roads. In fact, Charters has gone so far as to say that rivers were only of value for the transport of things of low value and great bulk, like coal. River and road transport were not exclusive; each had its sphere of competence, and they were complementary. The two systems interlocked; roads served as feeders for the Severn, at Shrewsbury and Bridgnorth, Considerable quantities of cheese, not made in the immediate area, were loaded there. At Shrewsbury it came from North and South Cheshire, and at Bridgnorth from the Trent valley. Peter Wakelin, who has recently completed his doctorate on trade on the River Severn, has shown that the river was also used for the transport of a large number of light and valuable goods. Investigation of inland waterways before the canal age is bedevilled by shortage of information. There is evidence from court cases, but that is very much a lucky dip. For a number of the river navigations, such as the Weaver Navigation in Cheshire, very regular and detailed accounts were kept about goods in transit, but such examples are very few and far between. There is no equivalent for the Avon, for instance, and many records have been destroyed. Detailed accounts were kept for the tolls levied on boats passing under the Worcester and Gloucester bridges, but they do not exist in the corporation archives, and were probably destroyed in the nineteenth century, though it is just possible that they are lying uncatalogued in the Public Record Office. Consequently we know very little about trade between the river ports. A court case, for instance, shows that there was a trade in malt, but there is no means of quantifying it, or indeed the coal coming from the Iron Gorge area to supply all the towns down the river as far as Gloucester, overlapping with coal coming from South Wales, which has different characteristics. The so-called port books help with an important segment of trade. Port books were part of the customs system; they began in the mid-1550's, and the system was used until 1799. They were not a means of enforcing the payment of customs duties, but a way of making sure that goods were not exported without having paid customs duty. Gloucester acquired status as a port in the early fifteenth century; before then it had been a member of the port of Bristol. The Bristolians fought hard and seriously in the law courts against it, but in the end Gloucester had its way, and so Customs officials were established there. The method of recording customs duties was by way of a document called a coquet, whose purpose was to prevent smuggling and consequent loss of revenue. It also stopped people being asked to pay duty twice, first at Bristol and then at Gloucester. procedure was as follows; a boat from Tewkesbury would arrive at Gloucester; the cargo on board would be listed by a Customs official, and the master of the boat would then hand over a sum of money as a deposit, equivalent to the value of the cargo and higher than the customs duty, The customs official would then issue a coquet, which was a copy of the entry in the port book, and when the boat arrived at Bristol the cargo would be checked against the coquet before it was unloaded. 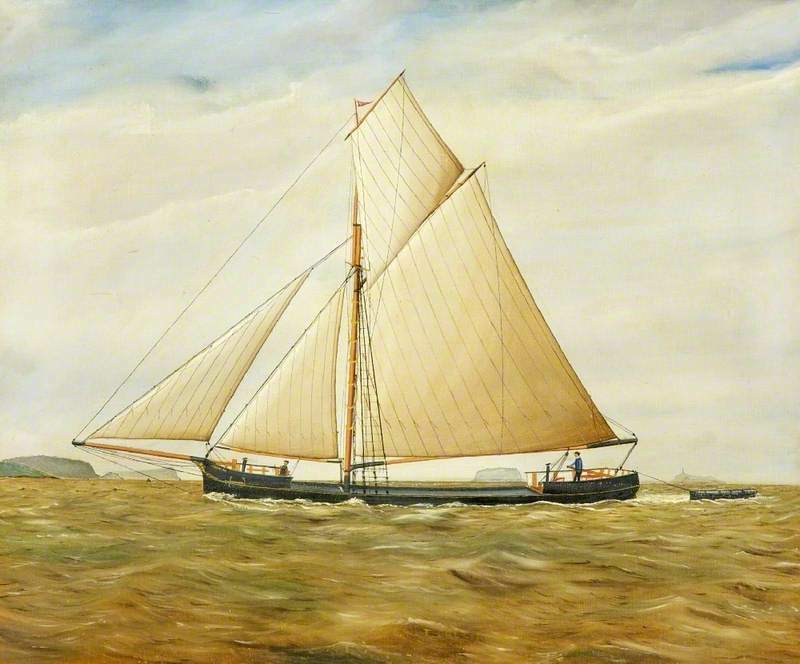 If it was correct the official would sign the coquet, and when the boat returned to Gloucester with the endorsed coquet it would be given to the customs official, who would then return the deposit to the master. At the end of the year the coquets and the port book were sent to the Exchequer in London, where clerks were supposed to check that the coquets matched the port book. The system was more complicated than it appears, as there were four different ways in which cargo could be taken through customs. For traffic upriver the system was simpler. The cargo was loaded at Bristol, and recorded in the Bristol port book; a copy was made of the entry on another coquet which was given to the master. No check was made; the coquet only certified that the customs duty had been paid on the goods. When the boat arrived at Gloucester a Customs official checked the cargo against the coquet, which was copied into the port book. If there were any goods on which duty had not teen paid the master was required to pay before the boat was allowed to proceed upstream. The port books give a detailed list of the boats which passed up and down river through Gloucester. but trade between Shrewsbury and Gloucester, or Tewkesbury and Gloucester, will not be shown if the goods did not pass through Gloucester. One boat from Shrewsbury carried two hogsheads of wine, one hogshead of vinegar, one and a half hogsheads of train (that is, train oil, which was made from fish and was used for a variety of industrial purposes), 8 hundredweight of cut cob tobacco, saltery (mainly sugar, but also butter and dried fruit) and 5 packs of rugs (at that time a bed was simply the frame and a rug was the cover laid over it). It is difficult to know what was meant by Manchester ware; it may have been goods made in Manchester, but it could have been a generic term. It seems not to have been cotton cloth, but rather trimmings, such as ribbons. However, there was no other town making these goods within the catchment area of the River Severn. It may appear strange that Manchester lies within the catchment area, but in fact it is only about fifty miles overland from Manchester to Shrewsbury, and it was probably quicker to send goods downriver to Bristol than by sea round the coast of Wales. Kidderminster ware meant glass and hats. The information in Table I shows the name of the boat and its master, its destination and the name of the merchant who owned the cargo, or any part of it. April 4th. The 'Anne of Tewkesbury to Bristol. James Harrison, senior, merchant and master; 8 tons of rock salt, 5 hogsheads of white salt, 25 hogsheads of cider, 1 wey of malt. 9th. The 'John of Tewkesbury' to Bristol. William Fisher merchant, John Harper master: 20 tons of soap ashes, 16 weys of malt, one bag of hops, 300 of iron wares, 3 boxes of apparel. 10th. The 'Orange of Tewkesbury' to Bristol. Thomas Tyler merchant and master: one ton of bacon, half a ton of tallow, 7 hogsheads of glovers' shreds, one vat of glue, one wey of malt, 4 hogsheads of vinegar, 23 hogsheads of cider and perry. 20th. The 'John of Tewkesbury' to Bristol. John Glover merchant and master: 25 weys of 2 hogsheads of cider, 100 bushels of white salt, 2 dozen chairs, 10 reams of paper. Upriver. 22nd. The 'Orange of Tewkesbury', Thomas Tyler merchant and master from Bristol: 6 chalders of coal London measure. 27th. The 'John of Tewkesbury', George Fisher merchant and master: 16 chalders of coal. Note: It is quite usual for more boats to travel downriver than up. We know from legal cases that they frequently returned empty, but some of the cargoes being carried may not have been recorded at Gloucester, Gloucester port books fist only those cargoes whose passage upriver had been authorised by a customs document known as a 'coquet', but Bristol customs officials also allowed cargoes of small value to proceed via transires'. Such cargoes were not recorded in the Gloucester port books. However, we do know that the Gloucester port officials only issued coquets, so the downriver data almost certainly represents all the traffic passing through the city into the estuary. Inwards, there was more variety; serge, made in the west of England, Somerset and Devon, and in Scotland; sugar; molasses; wool cards, used in the process of making cloth for carding the wool: train oil, and 36,150 lbs. of tobacco. In most years Tewkesbury consumed about 60,000 lbs. of tobacco, Bewdley (the port for Birmingham) about 120,000 lbs., Shrewsbury, for North Shropshire and Cheshire, about 100,000 lbs., so very large quantities of tobacco were being consumed even at this early date of 1599. It is surprising that so little French wine was imported, though both Spanish wine and a great deal of port came in. At that time there was a very heavy customs duty on French wine, so little was consumed in England in the seventeenth and eighteenth centuries, unlike the middle ages or today. From 1765, the last year for which we have a Gloucester port book, going upstream; the first item was 50 tons of Russian bar iron; peach wood, which was used in joinery, Madeira wine, three blocks of marble, dye stuff, shoe black, deal, deal boards, salt fish; all comprising a huge cargo, which must have been carried by a very large boat, which had sailed round from London. This is the kind of information that can be gathered from the port books, and it is possible to single out the trade of a particular town, like Tewkesbury. With the help of many people we have been able to put something like 37,000 cargoes on the computer, and the program is designed to allow us to extract any information we need. We can ascertain how much iron was carried from Shrewsbury as opposed to Tewkesbury, how many boats sailed per month, the names of the masters and merchants, and a variety of other things. It has taken almost ten years to assemble this data base. Provided it does not take too much time, information can now be provided for anyone who desires it. Port books are not available for every year. In the period 1576-1637 Tewkesbury boats were much more important than at any other time, forming something like 30% of the total of boats on the river in that period. The information for this first period is limited; it seems as if the customs officials had been told to record only particular items, of which lead was one, and was, of course, very important. Very little was recorded of the trade upriver, though it is not clear why this was so. We can only tell by inference what was not recorded. Other information given is the tonnage of the boat, where the merchant lived, and frequently his occupation, Later on that information was not given. In the middle period, from 1647 until 1725, there were much larger cargoes, but no information was given about the masters. In the last period, from 1730 to 1765, they no longer entered the boat's home port, so it is impossible to differentiate between a Tewkesbury and a Shrewsbury boat. In the years 1576-1605 part of the year was recorded rather than the full year, but there was good coverage for the early 1580's, the early 1590's and the early 1600's, with gaps in between. The first part of the seventeenth century is extremely disappointing; we have records from only one port per year. From the 1680's there are records from four or five, or even seven, ports each year, but there was a falling off after about 1740, Many records have been damaged; rats have nibbled them, corners have been torn off, bottles of ink have been spilt over them, and some are incredibly filthy, so there are problems in transcription. However, there are something like 7,000 cargoes in the port books and now in the data base. I have only recently started work on Tewkesbury, but I can tell you the sort of data that is coming from the port books. We have less information about Tewkesbury's trading background than about any of the other river ports, because we have not had a volunteer group working here. There is one at Worcester, a large one at Gloucester and a number of people working in Shropshire. There wasn't a local history society here to do any research, and the books about Tewkesbury that have been published recently have concentrated not on the economy of the town, but on other aspects of its history. It may be that the records are not available to produce a thorough account of the town's economy. There is no detailed account of the town, no breakdown of the number of people involved in a particular trade or industry, so there is no context for the information from the port books. We have not been able to see the effect of the improvement of the navigability of the Avon; did it improve the trade, or did it cause it to deteriorate? Was Tewkesbury the port for Herefordshire? How far did its marketing area go into the Cotswolds? Our information enables us to shed a certain amount of light on these questions. The most useful thing to do is to demonstrate the form in which we have transcribed the information from the port book, showing the categories into which the information has been broken down. First is the number of ships; Tewkesbury did not have the problems with the depth of water in the river which affected other ports upstream, so there was a much more regular traffic pattern than for Shrewsbury or Bridgnorth. A boat left Tewkesbury for Bristol or further afield about once every fortnight. Traffic upstream was much smaller. 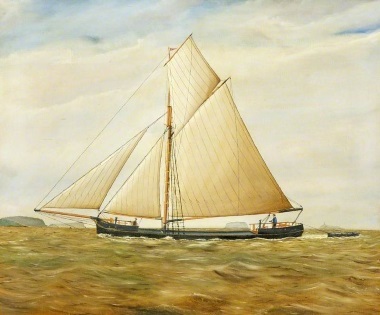 There were two reasons for this; boats travelled upriver empty or in ballast on many occasions; the second reason was connected with the system of recording. There was a second way by which a cargo could be taken through customs, by using something called a 'transire'. The government was hazy as to whether it wanted transires entered into the port books or not, so some ports did enter them while others did not. Fortunately, Gloucester never issued transires, so far as we know, but only coquets. The coquets probably represent the whole of the trade apart from fruit. Fruit was exempt, because by the time all the legal documents had been completed it would have gone off and be unsaleable; or so it was maintained in the argument presented to the Exchequer Court. We know that Bristol issued transires for traffic going upriver. They were not entered in the Bristol port book, no documents were issued, and so there is nothing to pick up at Gloucester. It is only through the work of David Hopley, another researcher, at Bridgwater, where they did record their transires, that we know that a number of Tewkesbury boats went there, though they were not recorded at Bristol or Gloucester. Upriver trade can only be used for illustrative purposes, and great care must be taken in attempting to quantify it. There was a sharp decline in Tewkesbury trade in the middle years of the seventeenth century; there was some recovery in the early eighteenth century, but never to the level of the Elizabethan period. This refers to percentages of the totals, not to numbers. The number of voyages was as high in 1710 as in the 1580's. This only applies to Tewkesbury; at Bewdley there were four times as many, at Worcester six times as many and altogether there was more traffic on the river. The other factor was, of course, that boats had increased in size. This did not mean that the amount of goods shipped through Tewkesbury had gone down; in fact, it had gone up, but not as fast as at Worcester or Bewdley. In the early years the biggest boat, in 1527, the last year in which tonnage is given, was 25 tons. With regard to the names of the boats themselves there was again a very considerable change over time. In the Tudor period the names fell into several categories; first, there were Christian names, but frequently not the Christian names given to children at that time; they were, rather, saints' names. Michael and Gabriel were quite common, though they were uncommon Christian names. Jesus also occurred on occasion, and George very frequently; it was, of course, a very common Christian name in the nineteenth century. There were also many boats called John. Names like Constance and Prudence also appeared, and there was one boat called Rabbit! Primrose, Lion, Speedwell, Hopewell, Mary Fortune; all were Tewkesbury boats of the Elizabethan period. Christian names included Matthew, George and Peter, an uncommon Christian name at that time, In the course of the seventeenth century the religious connotation disappeared completely, for no known causes. Christian names continued, but much more frequently they were the Christian name of the master of the boat, e.g. William Fisher of Tewkesbury, with his boat called 'William'. Often the boats were called after sons or daughters. In 1589 there appeared on the river a boat called the 'Orange', presumably because of William of Orange, who became William III. This was a Bewdley boat. A political element started to creep into the naming of boats, while names like Providence, Prosperity, Hopewell and Speedwell continued, but Christian names were still the most predominant. In the eighteenth century things changed again, and longer titles came in; Greek gods and goddesses, names like 'The Plain Dealer'; when a Quaker was involved as part of the partnership the word 'friend' was always part of the boat's name, There was never a name containing more than two or three words. The boat names tell quite a lot about cultural attitudes in England at the time. What sorts of men were the masters? Early on, in the Tudor period, there were large numbers of boats with independent owners, but by the seventeenth century there were wealthy families of boat proprietors, sometimes owning as many as ten boats. In Tewkesbury the predominant families were Hyett and Shaw; John Shaw junior and John Shaw senior; William Hyett, and a Thomas Hyett as well. In the late seventeenth century and early eighteenth century the main family seemed to be Harrison, James and John; they also had interests in both Evesham and Gloucester. In 1710 the Harrisons started to run boats from Gloucester to the Forest of Dean; it is almost certain that this was the Tewkesbury family taking advantage of a new trade. Another Tewkesbury name was Fisher, George and William,' there was also James Glover. A man named Wanklyn also operated from Tewkesbury. These are the ship owners; their boats were chartered by other people, but we know little about them. Occasionally, luck produces a piece of evidence, as happened with one of the Tewkesbury owners. Probate records are kept locally, but there are also some in the Public Records Office in London, usually when there has been a dispute about the will. This particular case related to a man called Abraham Eastoe; (there is a grave in the Abbey churchyard of a Thomas Eastoe, who may have been related). Abraham Eastoe died in 1768; he had recently married, and his wife had brought with her very considerable property, but she died shortly after her husband, and then there was a struggle about the inheritance between the two fathers. 'mere appear to have been no children, or if there were, they were very young. The probate inventory shows that the Eastoes had three boats; one was called the Little Francis, another the Stratford Galley, and the third the Warwick Galley. At the end of the inventory there was a list of people who owed Abraham Eastoe money, and a note of where they lived; in Gloucester, Worcester, Bristol, one in Camden and one in Stroud, others in Pershore and Evesham, and many from Stratford and still further afield, even as far as Northampton and Banbury. Unfortunately, the inventory does not say why these people owed Abraham Eastoe money, but they were probably people who had chartered his boats. This is the sort of evidence that can be found in court eases or probate, if you are lucky. In the earlier years debts were often listed, but after 1660 they are usually cited simply as 'his debts'. I can only quote some examples of the cargoes carried by Tewkesbury boats. Malt was by far the most important cargo, and of all the ports on the river Tewkesbury was the most important for the carriage of this cargo, as you would expect. The figures are based on weight. Gloucester was also important as a malting port, but in only one year did it carry more than Tewkesbury. Cider was also an important cargo, and Tewkesbury was the most important cider port after Worcester. Surprisingly, stockings, although their manufacture was Tewkesbury's most important industry, do not feature largely as a cargo. They were mostly transported overland, but the only boats which did carry stockings came from Evesham, Worcester or Tewkesbury. Quite considerable amounts of timber and wood were carried, but beyond that it appears that cargoes from Tewkesbury were more varied than those of any other port. This reflects the fact that Tewkesbury's catchment area was not industrial; it was agricultural, with stocking-making as the only industry. The other interesting thing is that, unlike Gloucester, Tewkesbury did not have a very important transhipment function. Tewkesbury's importance as a port was that it carried goods very considerable distances. We do not need to transcribe the Tewkesbury coquets, for the information is already on the database, but we lack the context into which the figures will fit. The will of James Glover or the probate inventory may be available, for instance, or his name may be on the parish register, or he may have married a girl whose name we can recognise as the daughter of another shipowner. It is in that area that we need to carry out further research.